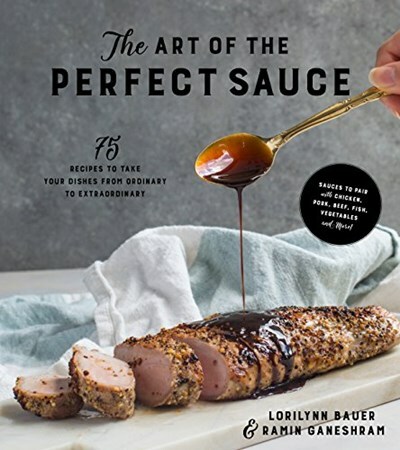 In The Art of the Perfect Sauce, Lorilynn Bauer and Ramin Ganeshram will help you breathe new life into your dinners with tasty sauces that are a breeze to make. With decades of culinary experience between them, they know the importance of a good sauce for restaurant-quality meals in your kitchen. Using traditional and modern twist recipes for gravies, glazes, compound butters, syrups, aioli and so much more, you’ll be able to add depth to everything from meat and poultry to vegetables and fish. Try pairing the Spicy Black Tea Jus with filet mignon for an elegant evening meal or toss Caramelized Garlic and Shallot White Wine Sauce with your favorite pasta for creamy perfection. A splash of Buccaneer Chimichurri pushes a freshly grilled steak to a whole new level and Candied Ginger and Apricot Sauce takes waffles from average breakfast to 5-star brunch in no time. With this cookbook you can master the art of reinventing meals, one simple and delicious sauce as a time.